You know your pet is the cutest, now it’s time to prove it. Okay, we know what this looks like. We know that a “Cutest Pet in Dallas” competition might come off as nothing more than an opportunity to look at adorable animals on the internet for minutes or hours on end. But you’re wrong. This is serious business. This is a grueling inter-species battle based on the predominately subjective state of cuteness. This competition will change one pet’s life forever. Do you honestly think that Ryan Reynolds has ever not brought his “Sexiest Man Alive” title during an argument with Blake Lively? That’s insane. Of course he does. So here’s how it works. From now until April 27 at midnight, we’ll be accepting images of your cat, dog, hamster, chinchilla, parakeet, or whatever your chosen pet may be (cuteness knows no bounds!) along with a $35 entry fee (a portion of which will be donated to the Humane Society of Dallas). For your troubles, you’ll receive a digital cover of D Magazine with your pet as the star. 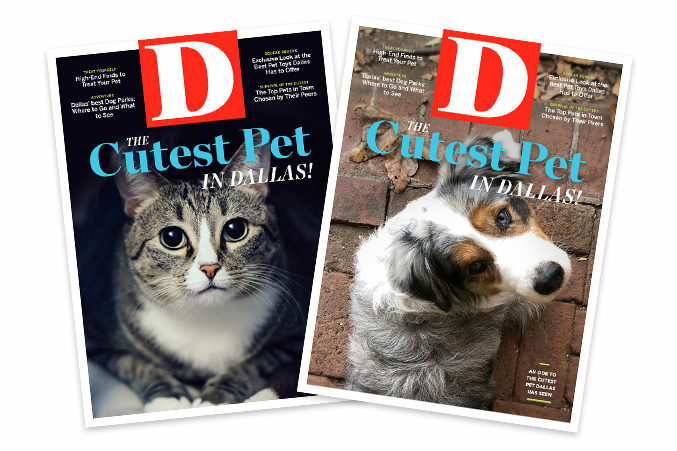 Then, beginning on May 7, D Magazine readers will have a chance to vote on your pet and more in endless head-to-head battles (think “Hot or Not” but more “Meow or Ow” and “Woof or Oof”) to determine the one true, undeniable, unparalleled Cutest Pet in Dallas. Everyone who submits an entry will receive a digital version of a D Magazine cover with their pet as the star. It will be cute! For the winner, there will be a D Magazine Instagram post, of course, broadcasting your pet’s endearing charm to more than 128,000 followers. Then, to further solidify your pet’s superior status, he or she will be whisked off for a professional photo shoot with a D Magazine photographer, then glamorously featured in a full page in an upcoming D Magazine issue. So the next time your friend looks their own dog in the eyes and says, “Aren’t you just the cutest! ?”, you’ll quietly nod and smile but you’ll know better. You’ll have the tangible proof that yours is, in fact, the cutest. That’s serious business, guys.